We are getting ready to go back to Uganda fro our annual trip. This year there will be a new person to meet. Akidi Doria Nicole was born about a month ago to our mentor Rachel Akullu and her husband Fred Watum. It will be good to see Walter and Sam again as we work out our program for the next year. We are excited to see the students again and to add three more students to ChildrenUP. We have a lot of work to do when we get there and only 2 weeks to get it all done. I am hoping to squeeze in a Rotary meeting or two. We have other friends whom we will attempt to fit into our schedule as well as doing a bit of shopping. Nancy Akumu started her professional career as a Research Assistant with BBC World Service Trust while at Makerere University. Immediately she completed her first degree in Forestry, she volunteered with Opportunities for Environment Planning (OPEP) Consult Ltd- Kampala and later became an Environment Officer in that same consultancy firm. She worked in partnership for various local and international consultancy firms in Uganda including COWI Ltd, VSHydro Ltd, Uganda Investment Authority (UAI), Green Label Serveices (GLS), Uganda Coffee Processing Industry (UGACOF), among others. Later, she started a forestry business with Global Woods Uganda and still progressing well. This business was aimed to help her family members in paying school fees for her young siblings. Presently, she received an Environmental training opportunity as a Young Environmental Trainee with WWF (World Wide Fund for nature)-Uganda Country Office for a period of six months i.e. from June-December 2012. In August-2012 I will begin my master’s programme in ENVIRONMENT AND NATURAL RESOURCES MANAGEMENT at Makerere University. 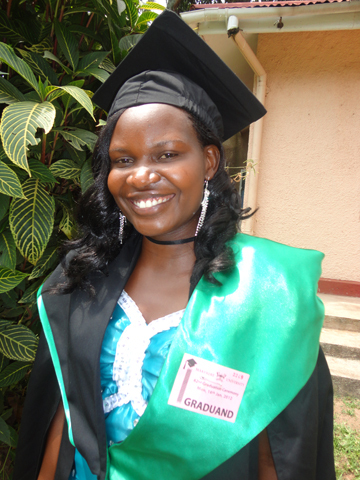 After my master degree, I hope to actively participate in combating climate change in Uganda and the world at large. After my master’s degree I look forward to new opportunities having been recognized by various worldwide institutions and organizations. ChildrenUP has chosen two new students to its roster of supported students. As always we choose students who have scored highest in the national Primary School Leaving Exam. They are always students who come from financially strapped families. We also check that they are consistent hard workers. Rovister is 15 years old. During the war in northern Uganda her father was a soldier who disappeared. Her mother is a farmer who provides for Rovister and her 6 siblings. She was our top choice for sponsorship because of her outstanding academic performance, focused mind, confidence and strong work ethic. At school she was selected as head girl and has given speeches at various educational activities. She dreams of becoming a doctor. Geoffrey is 14 years old he is a total orphan who lives with his uncle. Both of his parents were killed during the war. Luckily he was too young to be abducted by the LRA (the rebel group, The Lord’s Resistance Army). He has managed to pay the small primary school fees by cultivating a garden and selling the vegetables at market. Due to financial constraints, he was not able to go to secondary school and repeated the last year of primary school. ChildrenUP is actively looking for sponsors for these two children as well as others. Previous sponsors have been individuals and couple. Other sponsors have been groups of people that decided to sponsor a child in memory of a loved one. In one case, a school has taken on the responsibility of sponsoring a student. The $1,000 yearly cost for the boarding schools includes tuition, supplies and mentoring. Though we are a small organization, our aim is to make a difference in the lives of a few. One advantage we have is that we can keep sponsors aware of the progress of their student. Give the Gift that can transform the World! The ChildrenUP teams ~ US Team and Uganda Team ~ wish you and your families a happy holiday and wonderful New Year. Thank you for your support in spreading the word and investing in the education of the children. This year give the gift of ChildrenUP Giving Cards. You and your loved ones will appreciate that your gift makes a difference by helping academically gifted students reach their potential. And, you can give confidently, knowing that 100% of all donations go directly to helping our children. Call ~ 630-832-9010 or go to the ChildrenUPwebsite to arrange for your Giving Cards purchase. This has been a long time coming; our students now have an assortment of textbooks for their classes. This is not an event that comes easily in Uganda where most of the students do not have an access to textbooks, but solely rely on teacher class notes. After compiling the text books in an office, each book was carefully stamped on the exterior edge of the pages with the Children UP logo. It was an exciting day when the Ugandan mentors were able to go and deliver the books to the students at the four schools. Sam adds: “The students were appreciative and very happy”. We have a number of photos that show the books being delivered by Walter. The students have a two-month break between school years that begins in approximately two weeks. These students can use the books over the winter break and come back to school, even better prepared. Special thanks to our mentors Walter, Sam and Rachel for making the Children UP program work. Our students are doing remarkably well. Without completely understanding the complexities of buying textbooks for Ugandan students, this is what we have learned so far. The secondary students take about 14 classes a term depending on the school they attend. Some of these classes are considered to be core classes. Since classes may meet only once or twice a week, a textbook is good for all four years of “O” Levels. Then for the two year “A” Levels a different set of books is required. That’s the background. In the United States if a high school student signs up for a course, he/she is automatically told what textbook to buy for the course. In Uganda, the teacher supplies all the information by writing the information on the blackboard. For many students this is all the information they have. Those taking their education seriously want supplementary materials so that they can study in the evenings and on weekends. Unfortunately, there are various options for choosing study guides from books to pamphlets. In this case our mentors talked with students and teachers at all four schools to determine what materials would best benefit all the students. Bought in bulk these materials have been recently distributed to all the students. We thank the mentors for their conscientious attention to the details of helping our students succeed.